Paradise Parrots had all but disappeared by 1900, probably the result of a sudden decline brought about by the combined effects of the expansion of agriculture and grazing and a period of prolonged drought. The last confirmed sighting was made in 1928 although there have been a number of reports since that time, most of them unsubstantiated. The most recent reliable sighting that I can trace was made by Eric Zillman's father back about 1940. The recently published book Glimpses of Paradise by Dr Penny Olsen and published by the National Library, ISBN 9780642276520, is not only a very attractive and well illustrated book but a comprehensive review of the history of the Paradise Parrot. My pictures below are attempts by me at reconstruction using PHOTOSHOP based on both Hooded and Golden-shouldered Parrots as models. The termite mound (minus the nest hole) I photographed near Proston in Queensland close to where Cyril Jerrard took his pictures of nesting birds back in 1922. 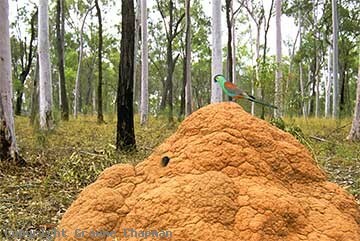 The species of termite is Nasutitermes magnus and these are the mounds that were generally used by Paradise Parrots. Unfortunately the tall eucalypt woodland in the background is probably a 50+ year regrowth and gives you no idea of what the country would have looked like back in the 1800's - probably more open with fewer and older trees, a sparse shrub layer and a variety of grasses. 299202 ... My vision of what might have been - the bird is extinct, the habitat different. 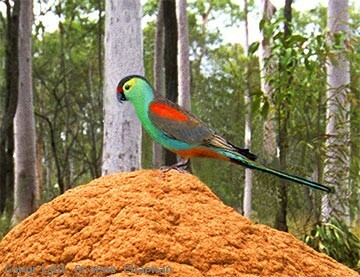 299206 ... Paradise Parrot , male, a PHOTOSHOP reconstruction.